A judge temporarily stopped Cody Wilson from posting 3-D gun blueprints online. 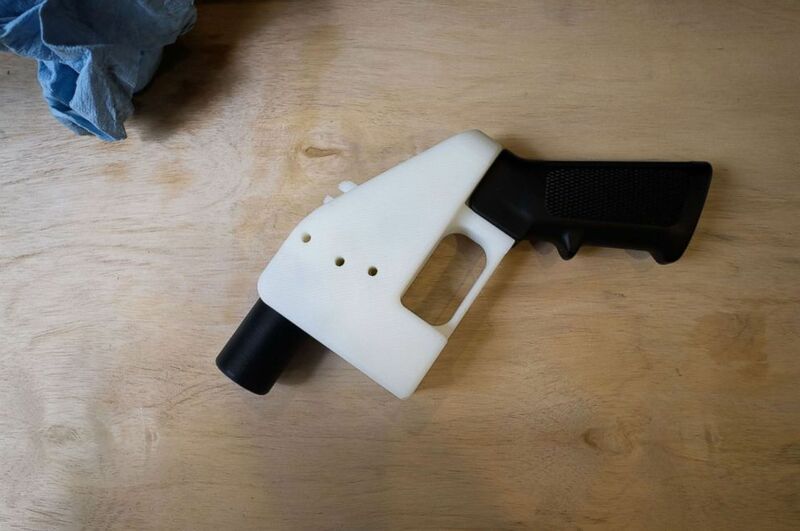 For years, Wilson has fought to make sure anyone should be able to download the files to make a gun at home with the click of a button using a 3-D printer or a computer automated milling machine. Last week, a federal judge temporarily stopped him from putting gun blueprints online -- the latest chapter in an ongoing battle with the federal government, 19 states, the District of Columbia and gun control advocates. 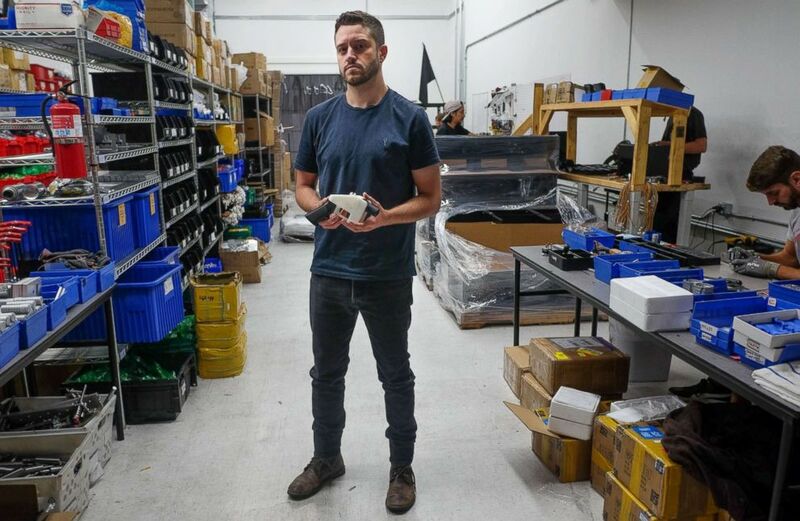 (Kelly West/AFP/Getty Images) Cody Wilson, owner of Defense Distributed company, holds a 3D printed gun, called the "Liberator," in his factory in Austin, Texas, Aug.1, 2018. Wilson invited “Nightline” to Austin, Texas, which is the home of his company Defense Distributed. The 30-year-old said he originally wanted to be a lawyer. They shared the blueprint file on the internet, where Wilson says it was downloaded more than 100,000 times in just the first week. That’s when the federal government jumped. The State Department argued that by posting the blueprints, Wilson was basically doing the same thing as exporting weapons abroad. Wilson took down the blueprints, and in 2015 filed a lawsuit against the State Department arguing that the digital gun blueprints are a form of free speech. Wilson says it’s both a First Amendment issue and a Second Amendment issue. “It’s both, but the way that this had to be fought for years in court was on a First Amendment claim,” Wilson said. (Kelly West/AFP/Getty Images) A 3D printed gun, called the "Liberator," is seen in a factory in Austin, Texas, Aug. 1, 2018. Andy Greenberg, a senior writer at WIRED, has covered Wilson and the digital DIY gun debate since 2012. “All the headlines are always about 3-D printed guns. But for Defense Distributed 3-D printing is almost just like a stand-in for this idea of any kind of digital tool that allows you to with just a download and a click create a gun component at home,” said Greenberg. In a surprise turn this summer, the Trump administration reached a settlement with Wilson and Defense Distributed that would have allowed him to publish his gun blueprints online. He started publishing some of the files on July 27 but was forced again to remove them when a judge issued a temporary restraining order last week. Wilson says that his aim is less about making weapons but instead giving people the tools to make a gun. “Posting guns to the internet my goodness in these terms knowing the attorneys general will sue, nothing beats it," Wilson said. At his company’s Texas headquarters, Wilson showed how his company has moved beyond the 3D printing of plastic guns into making metal guns using a computer-automated milling machine. Wilson has developed a computer-automated milling machine, which is small enough to sit on a desk, and it costs just $2,000. It carves metal parts into the main component of different firearms like the AR-15 and glock. “This will take you a couple of hours, and it doesn’t require your constant intercession,” Wilson explained, while the machine milled part of an AR-15. Unlike the plastic versions that sometimes malfunctioned, experts say the metal versions can be similar to what you buy at a gun store. Weapons like these have been called “ghost guns,” as they have no serial number, can be assembled at home and are virtually untraceable. “The term ghost gun refers to guns that really appear out of nowhere," Gardiner said. "We don’t have any register of who bought them, how they were sold." 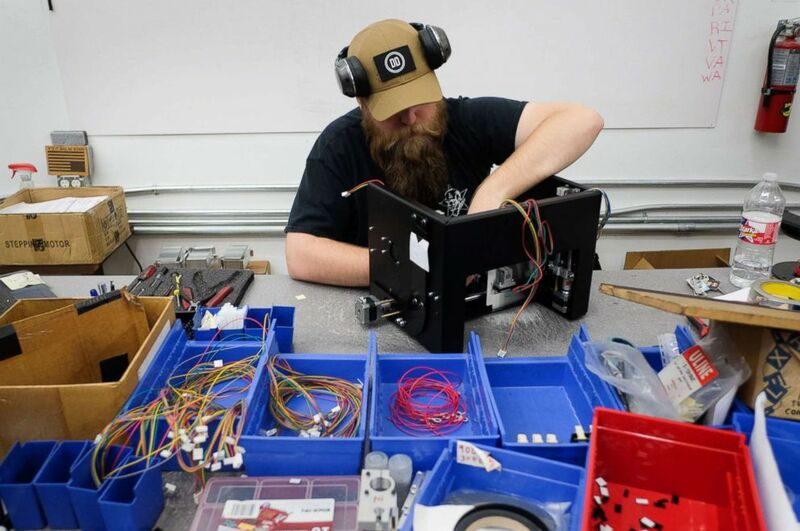 (Kelly West/AFP/Getty Images) J.C. Cotter installs an electronic package for a Ghost Gunner milling machine at the Defense Distributed factory in Austin, Texas, Aug. 1, 2018. But homemade guns are not new, and in many cases perfectly legal. But critics say Wilson’s machine could make it easier for these firearms to get into the hands of people who aren’t legally allowed to own guns, like felons or the mentally ill.
“We have seen ghost guns used in shootings around America in the last several years,” said Gardiner. Leticia Franco still remembers the day five years ago when a gunman opened fire in Santa Monica, killing four five people, including Franco’s father and sister. The shooter had used a ghost gun. An investigation revealed that he had a history of mental health issues, and previously had tried to buy a gun, but was denied. The shooter instead ordered parts online, and assembled them into a gun himself. This incident was not at all connected to Wilson, but Franco says she’s afraid of what Wilson’s doing. Wilson says he is aware of the potential dangers of making access to ghost guns easier. For now, Wilson is stuck waiting to find out if the courts will allow him to upload those gun blueprints, despite the fact that other websites already have posted the exact files that Defense Distributed was hosting on its own site, according to Greenberg. “The government has, essentially, failed, even though they tried this legal approach, they have failed to censor this information. It’s getting out there,” Greenberg explained. In the meantime, Wilson is continuing business, shipping out those milling machines, of which he said he’s sold a thousand so far this year. Despite all the legal battles ahead, Wilson says he refuses to back down.